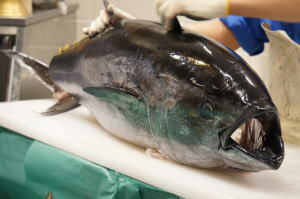 Chu-toro Nigiri Zushi ('中トロ握り寿司', is classified into sushi), is known as Medium Fatty Tuna Nigiri Sushi in English, and 中肥金枪鱼 握寿司 (Zhōng féi jīnqiāngyú wò shòusī) in Chinese. 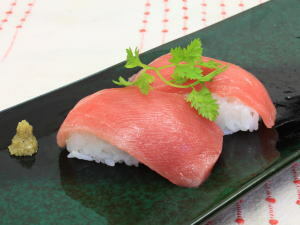 Chu-toro Nigiri Zushi is a hand-formed sushi that set medium fatty tuna on a formed sushi rice. We can eat this dish at sushi restaurants in Japan.